Step 1: Click the 'plugins' tab in the 'Workspace Inspector', and create a new 'Preview Window' plugin. 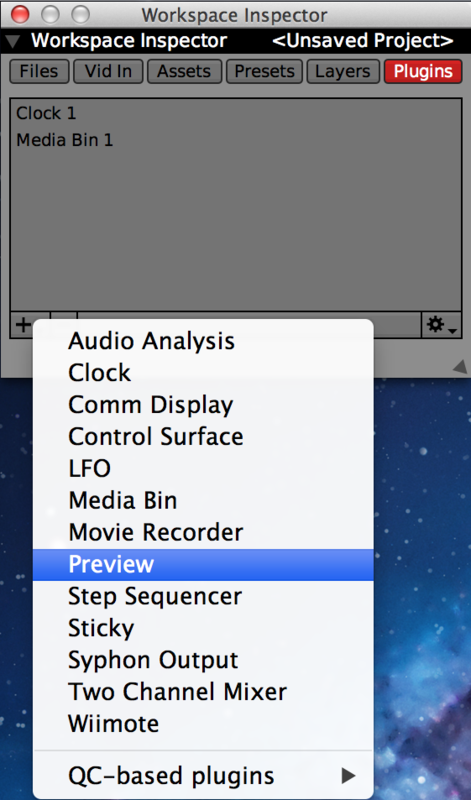 Step 2: Pick a video stream to preview using the pop-up menu in the title bar of the plugin window. Tip: When previewing a layer the plugin will reveal an opacity slider and blend mode button that are tied to the ones for the layer for quick access. Also when applicable mouse clicks can be passed from the preview to the source and FX being applied to it.